Attention Shoppers: If you love those Black Friday bargains but hate those Black Friday crowds there's good news for you. 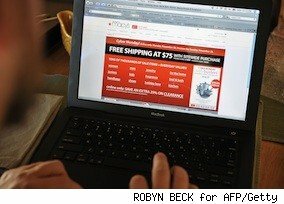 Scores of online one-stop shopping sites will be up and running the Friday after Thanksgiving allowing consumers to dodge the masses while comfortably shopping via computer at home, at a favorite coffee shop, or wherever a laptop can access WiFi. Although most major retailers and national brands will have websites dedicated to offering their goods and products for sale, the easiest way to shop for deals is on the sites that aggregate everything at one Internet address, so you won't have to search individual sites. BlackFriday.info also displays a long list of products by category, so shoppers can click on links connecting to ads and offerings of the specific products they're hunting for – digital cameras, desktop computers, laptops, electronics, just to name a few from among the dozens listed. Consumers with a preference for specific stores can also access their favorite retailers, since most of them will have a presence on this site. Also offered as another convenience is an e-mail alert system, by which consumers who sign up for the service can be alerted by e-mail about special discount deals, either in general, or for specific pre-indicated products. Some bargains will be available for one day only, others may be available longer. Smart online shoppers will calculate the costs of shipping and handling products against the expense of actually buying from the retail outlet. There may also be savings in local sales taxes. Be sure also to check out return policies, which may differ from retailer to retailer. And as always, in any buying transaction, save receipts, guarantees, warranties and other documentation. For consumers who need to visit several big box stores to get their shopping done, the time spent driving back and forth, looking for a place to park and standing in checkout lines may exceed in value the savings and will therefore not be worth the effort. The downside of online shopping, of course, is not being able to see, examine and feel the merchandise. There's also no sales clerk available to answer questions about the product. So be sure also to check out return policies, which may differ from retailer to retailer. Despite these obvious shortcomings of the "online multi-brand department store," shopping may be the way to go for cost-conscious bargain hunters who want to save time as well as money, and who want to avoid the throngs and hassle of Black Friday. Although online shopping has increased significantly in recent years, there's no danger that big box retailers will eventually become extinct – not yet anyway. "... You should know that online retailing is still only about 7% or 8% of total industry retail sales, so Internet shopping serves as more of a crucial component to the whole picture than it does as a threat to the store front," said Kathy Grannis, Director, Media Relations, National Retail Federation, a retail trade industry association. Nevertheless, a report from Goldman Sachs, quoted on Internet Retailer which tracks online shopping trends, forecast huge growth for the Internet retailing sector in the coming years. "Goldman notes that e-commerce sales will grow by $68 billion to $624.17 billion in 2020 from $555.92 billion in 2019, as offline retail sales grow $60 billion, to $3.64 trillion from $3.58 trillion," said the report, in part. But the success of Amazon.com. according to the report, can be attributed to its presence in the world's other major economies, besides the U.S. These include China, Japan, the U.K. and France. For Amazon.com, like Walmart, growth is coming from outside the U.S., as shoppers worldwide enjoy the perks of online shopping. But the children of online shoppers may justifiably ask how can they possibly sit on the lap of a jolly, rotund Santa Claus and whisper their Christmas gift wishes if Mom doesn't take them to the store.